Leora stretched out her arms towards the light. She thought the white spots would have disappeared by now—and it worried her. But Parthiv, Leora's husband, brushed off his wife's fears; he assumed they were probably nothing. But when the spots grew numb and oozed puss, a fearsome word haunted Leora's mind: leprosy. 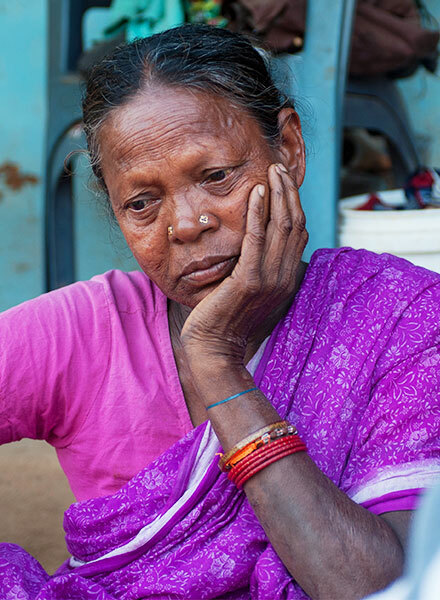 Leora, much like this woman pictured, suffered rejection simply because she contracted leprosy. After the disease ruined Leora's limbs, life became miserable for her. When leprosy took over Leora's body, Parthiv started to notice. He saw how his wife suffered as the leprous bacteria ate away at her nerves. Leora's wounds began to smell, and life became miserable for her. In her greatest moment of need, Parthiv left her without a warning or a trace. All in one moment, leprosy stole Leora's security and demolished the heart of her husband. After her husband abandoned her, Leora's neighbor took her to a nearby leprosy hospital. Though Leora was just one of the 200,000 people who were diagnosed with leprosy around the world, she was one of the blessed few who received treatment. Sadly, because her condition was not caught or treated earlier, she had to be in the hospital for more than two months. Even after receiving medication and having her wounds cleaned, leprosy still lived inside her body. Though it lay dormant, it had destroyed her marriage and ate away her limbs. But worse than the disease itself, Leora endured the stigma associated with being branded by leprosy. Many believe you can easily catch leprosy by simply touching those who have the disease. Because of this fear, infected people are separated from society. Family members may even force them out of the home, leaving their own relatives to fend for themselves in a world that already looks on them with disgust. For centuries, leprosy has stolen people's dignity and future. Leora's life was no different. After a few hours of hard labour, Leora grew very hungry, and like many other days before, she had no lunch. Hoping someone would be willing to offer something to fill her growling stomach, Leora submitted to begging for her meal. When she went up to a nearby home, a lady named Sabitha answered Leora's plea for food. Sabitha, a relative of a local GFA-supported pastor, noticed Leora's leprous condition, but instead of following the example of Leora's husband and rejecting her, Sabitha extended love. "Jesus loves you," Sabitha said as she provided Leora with a meal. Leora opened up about her life's struggles and pain to Sabitha's trustworthy and listening ears. Sabitha, in turn, shared the love of Jesus and encouraged her to go to church. She gave Leora directions to a church led by a GFA-supported pastor where she could attend that Sunday. Without hesitation, Leora went to church with a few of her friends. There in the church building, Leora felt a fresh sense of peace and joy come into her heart—she was finally meeting with the One she had heard about. Everyone welcomed her so warmly; they seemed to take little notice of her deformed body. What she experienced was the joy of acceptance and belonging thousands of leprosy patients are receiving through GFA's leprosy ministry as God's children pour out love, despite the stigma of the disease. Leprosy can be a very lonely, heart-wrenching disease. God is revealing His love to precious leprosy patients through the ministry of GFA World. After the church service, Leora expressed to the GFA-supported pastor, Purnendu, that she wanted Jesus to live in her heart forever. She had heard about Christ in the hospital, experienced Christ through the compassion and meal Subitha offered her, and welcomed Christ's love and redemption into her life that day. Leprosy's destruction didn't win out in Leora's story. It couldn't steal her new life in Jesus. Today Leora is recovering from leprosy. Her wounds no longer give her aches or emit a foul smell. Her life of misery has left her as she has embraced Christ. Now she lives a life of hope and one full of God's love and peace. "I thank the Lord my God," Leora testified, "for His lovingkindness and tender mercies in my life." Leora's life is just one among the masses living with leprosy today. By God's grace, 44 leprosy colonies in Asia, along with the countless precious patients within, have been touched through the leprosy ministry supported by GFA. Just like Leora was shown love and compassion from believers in Christ, many today in leprosy colonies are being served and loved by GFA-supported workers and specially trained women missionaries called Sisters of Compassion.